Windows users are well familiar with various blue screen errors. If these blue screen errors are not fixed permanently, they keep recurring from time to time, sometimes in the middle of an important work related tasks, playing games, doing assignments, watching movies or shows, and on many other occasions. 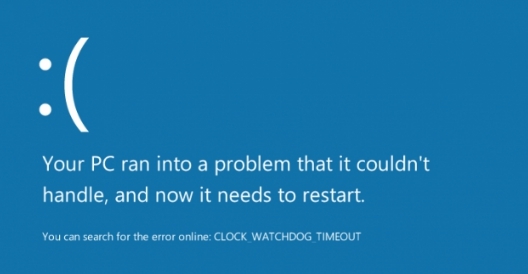 Similarly, clock watchdog timeout error can occur in Windows 10, Windows 7, Windows 8 / 8.1 powered devices. Below you can see some of the best method to fix CLOCK WATCHDOG TIMEOUT error on Windows 10 as the error is likely to afflict Windows 10 than the other Windows OS versions. But before that, see the main reasons being CLOCK WATCHDOG TIMEOUT error on Windows. The CLOCK WATCHDOG TIMEOUT error could be the result of a corrupt Windows registry, corrupt RAM or memory, incompatible or corrupted drivers, damaged systems files, driver error after installing new drivers, disk drive error due to damage, malware, virus. I might’ve missed some reasons but these are the main ones that cause CLOCK WATCHDOG TIMEOUT error on PC Windows. After testing various methods, we have found the following method to be working perfectly to fix CLOCK WATCHDOG TIMEOUT error in Windows OS. There’s no guarantee that these methods will work on your device as different PC hardware require different fixes. But you can try these one by one until to manage to find the one that fixes CLOCK WATCHDOG TIMEOUT blue screen error on your Windows PC desktop/laptop. If you haven’t updated Windows OS on your device, we recommend that you do so immediately because sometimes bugs in the current OS update installed on your device could result in malfunction. Best way to keep your Windows OS in top condition is to download Windows updates regularly as most of the times they come but bug fixed and performance improvement features. There are many top quality free third-party software available that automatically fix registry errors in Windows. Use reliable tools such as Ccleaner, AVG tuner, Avast and other tools for fixing registry errors. Keep your device clean from viruses and malware using Windows Defender, or a third party antivirus program. This method mostly works to fix clock watchdog timeout error on PC Windows. Regularly creating a system restore point is a good habit that allows you to return to previous point in time when the Windows was in perfect working condition before some error starting causing issues. If you have created a system restore point, simply restoring it fixes this blue screen error. If a faulty driver installation or incompatible driver update caused this blue screen error, then a system restore is the best method to fix this error. If the system restore is not working on your device, here’s how to get system restore back to normal working condition. Many Windows users found this method useful in fixing blue screen error. Here’s how you can run system file checker to fix clock watchdog timeout error. Press Windows Key + X on keyboard or right-click on the Start button and select Command Prompt (Admin) from a list of system functions. In the command prompt, type sfc/scannow and hit enter. Wait for the command to execute after which system file related issues will be resolved automatically. Restart PC to complete the process. This clock watchdog timeout fix should bring your device back to normal working state. It’s important that you keep the system BIOS updated on your device, especially on the older system. Older Windows PC with outdated hardware are particularly prone to clock watchdog timeout error. You can find latest BIOS update for your device from the PC manufacturers website. Find the BIOS update for your system model and install it. Be careful while downloading and installing BIOS as a slight mistake could result in errors, follow BIOS update instructions from manufacturer’s webpage or online forums. The method above should fix CLOCK_WATCHDOG_TIMEOUT error. However, if they don’t work on your device, you can reset or refresh Windows to fix this problem. Backup apps and data before resetting Windows as it wipes out existing apps, programs and other tools installed later on by users to return PC to default Windows state. You can restore backup after resetting Windows. This method may be a bit more time consuming, it definitely fixes the error. Or clean install Windows as a last resort to fix this blue screen error. Keep third-party antivirus tool installed on your device updated at all times, or try a new one, as sometimes antivirus program can cause this clock watchdog timeout error. Implement the methods above and share with us which one worked for you in the comments section below.